Lecture Based Via PowerPoint with Audio-visual aids to maximize student retention. Individual testing of didactic material. Written exams and a final exam. Group practice and inter-active study groups for skills requirements. This will reinforce the importance of teamwork to reach a common goal. Individual testing stations for students to demonstrate proficiency on manipulative skills. The course fee is $1,400, which covers the entire period of attendance and is equivalent to the entire educational program. 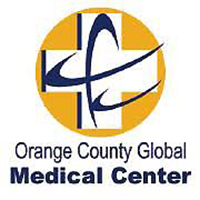 Description – Orange County EMT is offering Emergency Medical Technician-1. A course completion certificate shall be issued that meets the strict criteria of California EMS, Orange County EMS and is drawn from the National Highway Traffic Safety Administration. Upon successful completion from our 212 hour course students with an 70% score and higher on the final exam will be eligible to take the National Registry Exam. We do not offer licensure or a degree for this course. Orange County EMT Emergency Medical Technician-1 Course Completion Certificate. – Assure that the EMT-Basic candidates have a current card prior to entering the program. – Offer one or several programs of CPR prior to the start of EMT-Basic program. – Students seeking to enter that program to participate or test out. – Note: Although CPR is a prerequisite, it should be routinely practiced and integrated throughout the entire instruction of the EMT-Basic. Skill stations should be created to reinforce knowledge and skills. Orange County EMT will be offering a 6 hour CPR for Healthcare Provider course tentatively scheduled for he second class meeting prior to commencing formal EMT instruction. OCEMT has a goal of producing the highest quality candidate. In our profession, one must be a law-abiding citizen and have the desire to help those in need. We, as Healthcare Providers, are obligated to act with professionalism and maturity at all times. We have elected to hold our students accountable to these standards prior to entering the workforce. We believe that instilling these principles from the beginning will only help to build them for success. The refund policy for the return of unearned institutional charges for students who have completed 60% or less of the education program shall be a pro-rated refund. See refund policy. OCEMT does not have an articulation agreement with other institutions and all students must meet the listed admission requirements, including ability-to-benefit students. Be able to perform a patient assessment in need of medical care. Clearly recognize a medical condition and traumatic injury. The ability to have a concise treatment plan for anyone who is need of medical care. Strong understanding of the Scope of Practice of the EMT-1. Regular attendance with no more than 3 class sessions of unexcused absence. Orange County EMT fully understands that catastrophic and unexpected events do occur in family and life. It is to provide our students with the best chance for successfully completing our program that we must adhere to the attendance hours. Completing all 24 hours of Clinical Experience. An 70% or above on the Final Exam. There will be no Make-Ups for the Final. Passing all 8 skills stations after successfully completing the final with an 80% or above. There will be an opportunity for one re-test on any skill that is not completed with a passing score. Clinical Experience – 12 hour PRC observation Pass/Fail. Clinical Ride-Along – 12 hour ride-along Pass/Fail. Attendance – No more than 10 hours missed – will greatly affect ones ability to be successful. The Emergency Medical Technician assumes responsibility for individual professional actions and judgment, both in dependent and independent emergency functions, and knows and upholds the laws, which affect the practice of the Emergency Medical Technician. An Emergency Medical Technician has the responsibility to be aware of and participate in matters of legislation affecting the Emergency Medical Service System. The Emergency Medical Technician, or groups of Emergency Medical Technicians, who advertise professional service, do so in conformity with the dignity of the profession. Students are required to purchase the following textbook prior to the start of class. The EMT-1 training material is drawn directly form The National Standard Curriculum New Education Standards. Brady Publications is an excellent resource to reflect this curriculum specifically. Each and every student has the ability to be successful in this course if he/she follows lesson plans and puts forth the effort to learn the material. The transferability of credits you earn at Orange County EMT, is at the complete discretion of an institution to which you may seek to transfer. Acceptance of the Course Completion Certificate you earn thru OCEMT is also at the complete discretion of the institution to which you may seek to transfer. If the Course Completion Certificate(s) that you earn at this institution is/are not accepted at the institution to which you seek to transfer, you may be required to repeat some or all of your course work at the institution. For this reason you should make certain that your attendance at this institution will meet your educational goals. This may include contacting an institution to which you may seek to transfer after attending OCEMT’s EMT-1 Training Program to determine if your Course Completion Certificate will transfer. At this time we do not offer Job Placement Services to candidates that have passed this program successfully. Orange County EMT has established well-respected professional relationships with many employers throughout Orange County. It is our desire to eventually become a recruiting platform for employment within these organizations. Orange County EMT does not offer housing nor do we recommend any housing/dormitory facilities. It shall be up to the prospective student to find their own housing while attending this EMT-1 program. Orange County EMT does not admit students from other countries. It is not the responsibility of OCEMT to check immigration status of our prospective students. A Department of Justice Background check will be performed for the EMT wishing to become licensed in Orange County in the near future. All instruction and audio/visual aids will be delivered in the English Language. Orange County EMT does not award credit earned from another training institution and/or college or university. 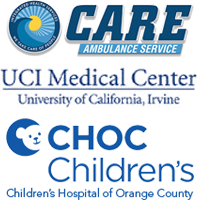 The 212 Hour Emergency Medical Technician-1 Program is an intense and challenging course that will have specifics taught that are Orange County CA specific. Any previous education in Health Science or Emergency Medicine will be beneficial to the student, however will not count as credit earned for this course. Failure to abide by all local and federal laws will be grounds for immediate dismissal from the program. Furthermore, all Rules of conduct found under “Program Code of Conduct” shall be followed with strict adherence. Any student dropped for violation of any policy shall be dropped from class without a refund. Any student found cheating will be immediately removed from class and dropped without a refund. Any student found under the influence of any intoxicant will be immediately removed from class and dropped without a refund. Violence or threatening behavior will not be accepted in any way. This will lead to dismissal and notification to local Law Enforcement. Failure to meet objectives stated in course achievement criteria will result in dismissal from this program. Also, any unlawful, unethical, or act seen as dishonest outside the guidelines set forth by the State of California EMS Authority or Orange County EMS may result in program expulsion. If such an occurrence does take place, there will be no refund of any kind for the student that has been separated from Orange County EMT’s training program. Any student who receives an exam score less than 87% will be placed on academic probation through out the duration of the course. Probation consists of a signed document signed by both OCEMT and the student, which states the student has achieved a sub-standard exam score and may be in danger of not passing the final with an 70% without a corrective action. Students must make every attempt to be at all class sessions. If a student is unable to attend because of other obligations, a maximum of 3 class sessions will be excused. Any student who is absent for more than 3 class sessions without contacting OCEMT will be dropped from the class, or will be placed on a Leave of Absence per our discretion. If placed on a Leave of Absence the student will have the option to enroll in the next course available to them. b. Administration will confirm your request to drop has been received. c. The date of confirmation will start the Refund period. (2) from the date Orange County EMT terminates the student or determines withdrawal by the student. Retention of tuition and fees collected in advance for a student who does not commence class shall not exceed $100. Orange County EMT shall maintain records of the name, address, e-mail address, and telephone number of each student who is enrolled in an educational program within this institution. – The EMT-1 course completion certificate granted and the date on which that degree or certificate was granted. – The courses and units on which the certificate or degree was based. – The grades earned by the student in each of those courses. – The educational programs offered by this institution and the curriculum for each. – The names and addresses of the members of this institution’s faculty and records of the educational qualifications of each member of the faculty. The Student Tuition Recovery Fund (STRF) was established by the legislature to protect any California residents who attends a private post secondary institution from losing money if you prepaid tuition and suffered a financial loss as a result of the school closing, failing to live up to its enrollment agreement, or refusing to pay a court judgment. 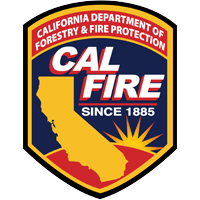 To be eligible for STRF, you must be a “California resident” and reside in California at the time the enrollment agreement is signed or when you receive lessons at a California mailing address from an approved institution offering correspondence instruction. – Present a neat, well-groomed appearance. – Dress according to the clinical guidelines, name tag visible. – Demonstrate dependability by reporting for duty on time and stay the full allotted scheduled time. – Notify the EMT instructor when ill or unable to attend scheduled clinical assignment . – Demonstrate cooperation and willingness to learn. 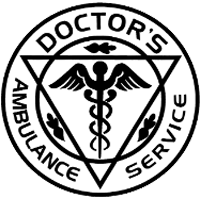 – Identify the location and purpose of the standard equipment found on a BLS Ambulance Unit. – Complete the BLS Ambulance Unit Checklist. – Perform a primary survey and treat patients. – Perform a secondary survey, record findings and give care. – Assist with patient care on the scene, at the discretion of ambulance personnel. – Monitor patient’s vital signs and status during transportation. – Take and record a minimum of two (10) patient assessments and histories, using the form provided. – Reassurance of family members at the scene. – Extrication of trapped persons. – Patient care during transportation, including monitoring of intravenous therapy. – Communication between the ambulance and hospital, including written and verbal reports. – Have Student Performance Documentation form completed by ambulance personnel. – Complete Student Performance & Observation Log on Training Plan. – Inform the ambulance personnel when leaving. – Dress according to the clinical guidelines, nametag visible. – Notify the EMT instructor when ill or unable to attend scheduled clinical assignment . Demonstrate cooperation and willingness to learn. – Measure and record temperatures, pulses, respirations and blood pressures. – Measure and record apical pulses. – Take and record a minimum of two (10) patient assessments. – Move, lift and transport patients to other units with supervision. – Identify the location and purpose of oxygen and suction equipment. – Identify the location of supplies, linen, medical equipment, etc. – Complete the Emergency Room Checklist. – The patient evaluation, including the physical exam and history recording. – The care given in emergency situations, including airway management, breathing assistance, oxygen therapy, control of bleeding, combating shock, care of the emotionally disturbed, pediatric patients and patients with medical problems. – Care of wounds and aseptic techniques. – Application of slings, elastic bandages, basic bandages and pressure bandages. – Methods of suctioning, including oral, oral pharyngeal, endotracheal and tracheal. – Monitoring of Intravenous Therapy. – Have Student Performance Documentation form completed by emergency room personnel. Instructors maintain licensure as California State Paramedics through 48 hours of Continuing Education every 2 years. Each instructor shall maintain their knowledge by completing continuing education courses in his or her subject are or other courses related to teaching. Orange County EMT is proud to offer the Emergency Medical Technician course. Our curriculum is covered over a 10-week period that meets 3 days per week. This course is broken down into 3 modules that equates to 212 hours total. Classroom Didactic Lecture and Manipulative Skills Training – 188 hrs. 911 Ambulance ride along – 12 hrs. Emergency room observation at Paramedic Receiving Facility – 12 hrs. 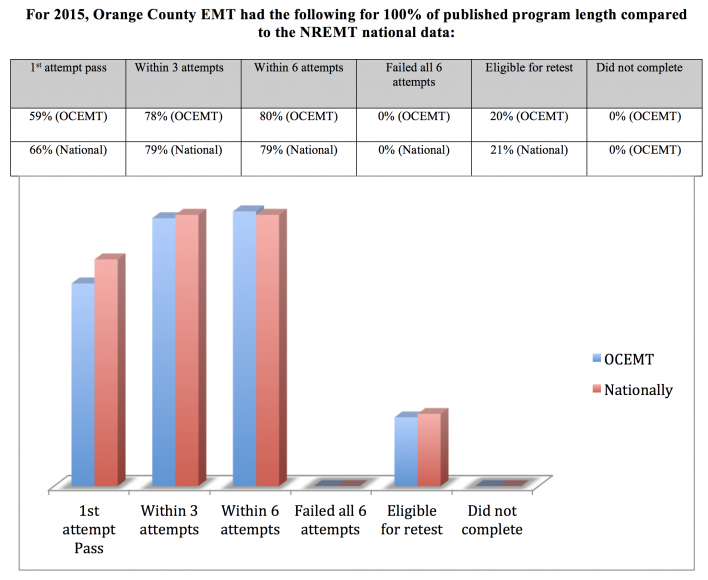 The following data is derived from the Secretary of Records for Orange County EMT. This information is intended to provide each prospective student the factual information about this program before he/she decides to register and pursue this career. It is important that each prospective student understand the course and all aspects of our teaching methodology, manipulative skills training, and testing parameters. We welcome questions and tours of facilities to better inform our candidates prior to enrollment. OCEMT had successfully assisted in placing 180 students into a full/Part time positions and or into furthering their academic pursuits in the health care profession. 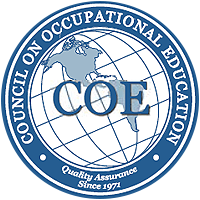 This data must meet the benchmarks for accreditation under Council of Occupational Education. Ultimately it is each student’s responsibility for their own future and employment opportunities. The information provided below reflects the 2015 calendar year for the months of Jan 1st thru December 31st 2015 for our EMT training program. OCEMT commenced with Class # 30 and concluded the calendar year with Class # 38. These figures represent our students that graduated from initial EMT training then went on to pursue the National Registry Exam. The National statistical data was pulled from the National Registry of Emergency Medical Technicians for the entire United States for all of 2015. www.nremt.org. The following information reflects the graduates from our EMT Training program for the months of January – December 2015. All successful graduates that moved forward to pursue NREMT certification are outlined below. Individual testing of didactic material. Written Exam for quizzes and final. *It should be noted that any student pursuing National Registry Exam, must maintain an 70% average and above throughout the entire course! Final Exam- 200 Question multiple choice worth 200 points. Clinical Experience- 12 hour hospital observation Pass/Fail. Clinical Ride-Along- 12 hour ride-along Pass/Fail. boundaries and the difference between hollow and solid organs. • Identify the anatomy and physiology of the female reproductive system. • Give examples of patients with special challenges EMT’s may encounter during a medical emergency. • Name four differently types of goals that commonly motivate terrorist groups to carry out terrorist attacks. I, ———————————————————–, am enrolling in the Emergency Medical Technician Basic program provided by Orange County EMT. I understand the course requirements set forth by Orange County EMT and the procedures to obtain an EMT 1 license through the State of California and Orange County EMS. I understand that this course is 212 hours, and that I must achieve an 80% on the Final Exam along with successfully completing all skills required by the state with a passing score in order to achieve course completion. I understand that only after receiving a course completion I am eligible to take the National Registry Exam, which I must successfully pass in order to apply for a County EMT 1 License. This Enrollment Agreement is valid for a period from the first day of class 1/12/16 through the last day of class 03/12/16. I acknowledge that this Enrollment Agreement is legally binding when signed by the student and accepted by ORANGE COUNTY EMT. THE COURSE FEE OF $1,300 COVERS THE PERIOD OF ATTENDANCE AND IS EQUIVALENT TO THE ENTIRE EDUCATIONAL PROGRAM. THERE IS A $400 DOLLAR ENROLLMENT FEE WHICH IS DUE AT SIGNING AND IS DEDUCTED FROM THE TOTAL FEE OF THE CLASS. Student’s textbooks are provided with tuition, however students are responsible for any fee’s charged by the National Registry, State of California EMS, County EMS for licensure, and DOJ Live Scan Background. Administration will confirm your request to drop has been received. The date of confirmation will start the Refund period. cancels the class, 100% of the tuition and fees collected must be refunded. The refund shall be made within 45 days of the planned start date. for a student who does not begin classes shall be made within 45 days of the class start date. orientation or following a tour of the facilities and inspection of the equipment. After the first 50% of the period of financial obligation, the institution may retain all of the tuition. You are not a California resident, or are not enrolled in a residency program, or Your total charges are paid by a third party, such as an employer, government program or other payer, and you have no separate agreement to repay the third party.” “The State of California created the Student Tuition Recovery Fund (STRF) to relieve or mitigate economic losses suffered by students in educational programs who are California residents, or are enrolled in a residency program attending certain schools regulated by the Bureau for Private Postsecondary Education. Students have a right to cancel and obtain a refund of charges paid through the first day of attendance or 7th day after enrollment, whichever is greater, minus the $350 dollar enrollment fee. If a student has received federal student financial aid funds, the student is entitled to a refund of moneys not paid from federal student financial aid program funds. A student requesting cancellation of their Enrollment Agreement must do so verbally and in writing to the Course Director or Chief Academic Officer of OCEMT, within 1 week of signing the contract. The student will then sign a “Cancellation of Enrollment” form which will be stored with the students original Agreement. A student dropping the course will receive a refund only if they meet the refund criteria listed in this Enrollment Agreement. “If the student is eligible for a loan guaranteed by the federal or state government and the student defaults on the loan, both of the following may occur. 7. Has been convicted of two or more misdemeanors within the preceding five years for any offense relating to the use, sale, possession, or transportation of narcotics or addictive or dangerous drugs. 8. Has been convicted of two or more misdemeanors within the preceding five years for any offense relating to force, threat, violence or intimidation. 9. Has been convicted within the preceding five years of any theft related misdemeanor. 1. Has committed any act involving fraud or intentional dishonesty for personal gain within the preceding seven years. 2. Is required to register pursuant to Section 11590 of the Health and Safety Code. – Does not apply to convictions that have been pardoned by the Governor, and shall only apply to convictions where the applicant/certificate holder was prosecuted as an adult. – A “felony” or “offense punishable as a felony” refers to an offense for which the law prescribes imprisonment in the state prison as either an alternative or the sole penalty, regardless of the sentence the particular defendant received.